After living on land for almost 9 months, we are glad to be in the boat again! and it was such a sweet reconciliation with her. I missed the certain smell of the boat the galley the cockpit and most especially our Master Cabin. weeks, or even months those days out on the ocean you will see the perspective what life is and how beautiful the real world is. Isn’t shes beauty this home of ours? Since we are back we found ourselves maintaining her of everything everyday. We are excited to be out on the ocean again and sailing with her on our long journey. Beside all the refit work, this is one of the worlds very pretty places, the city of Faro with quiet ancious roads and old charming houses invites for a walk and the fabulous beaches with prestine clear oceanwater invite for a day at the beach. The portugues cuisine has something for everyone and fishlovers find their eldorado here. This area in the very SW of europe is by far not that overrun like many other european places. If you like to get more information click the link at the end of this text and learn more about Faro and the Algarve. This is my blog for today. Please subscribe to be the first one reading our adventure story. See you soon! Subscribe on our YOUTUBE CHANNEL, FB PAGE AND INSTAGRAM! for more to come. 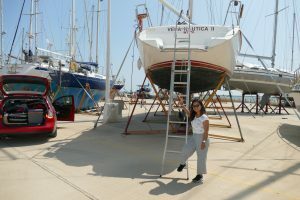 How is living in a shipyard while you set up the boat for its refit? See you soon..